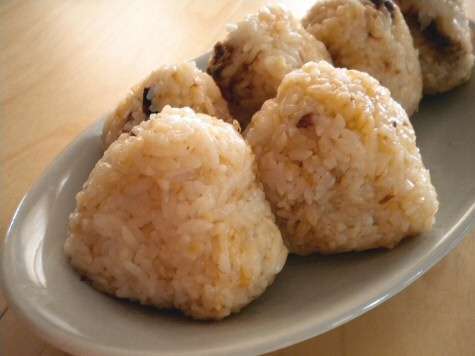 If you have some leftover rice and are looking to make a quick snack, try making some onigiri. It’s a very popular food in Japan that is found in almost every convenience store. It’s basically a ball of rice with a filling in the center that is usually wrapped in nori. The filling is most often a preserved food like salted fish or pickled vegetables. In the version above, crushed bonito flakes are mixed with soy sauce and then this is mixed together with hot rice. There is no center filling, so it’s a little easier to make. However, the hard part is getting the proper shape. You’ll need to form a nice lightly packed triangle with your hands. Be sure to wet your hands first, otherwise you’ll just have hot rice stuck all over your fingers. Gombatte! I am curious about the process of adding a filler in the middle. Do you just form the rice around it? I’m thinking this might be a good option for a get together I am planning vs the pepperoni with cream cheese I had planned.